I’d just like to start out by saying that I lasted a lot longer in the homesickness department than I thought I would. I tend to be a very emotional person. To say I’m close with my family would be an understatement; my cousins are some of my best friends and my parents are my rocks. 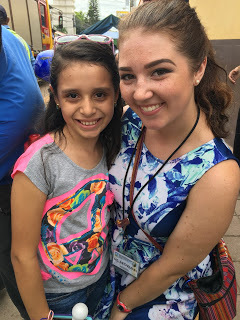 So, when I hit that one-month mark here in Honduras, and realized that I hadn’t gotten upset or homesick at all, I was pretty proud of myself. Fast forward to about a week ago and the lack of homesickness didn’t last too long. For reasons I’ll never understand, I started getting homesick all of a sudden. When I lay down at night and don’t have anything to distract me, I stare into space letting my mind wander. Usually, my mind wanders to sad places, but don’t ask me why that happens. It could be a combination of college starting back up, school here in Honduras getting crazier, or some other reason, but I can honestly say I’ll never know the answer 100%. m feed was filled with friends starting back at college, sorority recruitment beginning, and so much more, I began to realize that my life wasn’t going to stop for me. My entire 5 years of college all I wanted was to graduate and be in the real world. Now here I am, a college graduate, wishing I could go back. Don’t get me wrong, I don’t want to go back to the endless studying, stress over exams, and all the school stuff. I want to go back to the fun times I had with my sorority sisters, seeing my family on the weekends, and just being free. When I think back to college, I think about how I was never fully happy. I’m a people pleaser. I am so concerned about other people being happy and their well-being that I often forget about my own. I love helping other people, and I’d much rather other people be happy before I’m happy. When it comes to Honduras, it’s kind of the best of both worlds. Sure, I still have trouble saying no to people or whatever, but I came here to help other people because it makes me happy. Honduras was never a part of my plan. Sometimes I forget that. Being here, I sometimes lose track of why I’m here. When I get stressed, or upset, I forget that this is all a part of God’s plan for me. I came to Honduras to help provide a good education for the children here in Juticalpa, and ultimately find myself. I’m not perfect by any means, but I like to think that helping others and teaching are two of my strong suits. Every time I’ve texted a friend or family member saying how homesick I was, I’d get a response filled with I miss yous. However, following the missing, I’d be reminded by each person that I was made for this. I am meant to be here, in Honduras, at this very moment because this is all part of His plan. Sure, I may get homesick and cry my eyes out occasionally. But, when I see my students’ smiling faces each morning when they walk through the door, I’m reminded why I’m here. The unconditional love I have for my students thoroughly outweighs the sadness I feel when I’m missing home. So, while I initially wanted my “life” back home to come to a screeching halt while I was gone, I’ve realized that my life is right on track and the adventures I seek are just beginning. I’ve also come to realize that being homesick isn’t really a bad thing. It means I have something so wonderful back home to miss so much that it hurts. I have a family that loves me more than words and friends that support me no matter what. And, both of those things will be waiting for me when I get home. But for now, this is my home, and this is the life God has created for me. I couldn’t ask for anything more. Being homesick is nothing but a blessing in disguise. So, thank you, to everyone who supports me back home and is continuing their lives while I’m away.